The spray booms are controlled by an electrohydraulic system. 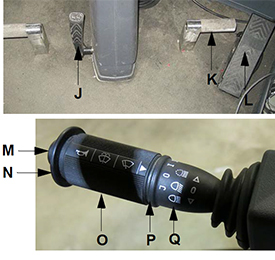 This system consists of operator-manipulated switches (located on the side console and the hydrostatic drive control handle) and hydraulic cylinders (attached to the booms), which provide lift, level, and horizontal extension. Hydraulically folding the extensions of an 18.3- or 24.4-m (60- or 80-ft) or 18.3- or 27.4-m (60- or 90-ft) spray boom and shutting off the outer sections essentially turns it into an 18.3-m (60-ft) spray boom. 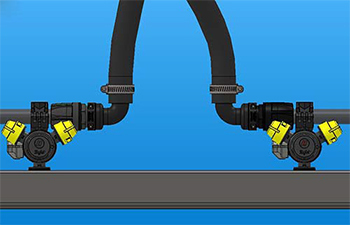 The wet boom connections are featured with ARAG® EasyFit fittings with an o-ring seal and are 13-mm (0.5-in.) schedule 5 pipe-fed from one end with a 25-mm (1-in.) hose. ARAG is a trademark of ARAG S.r.l. 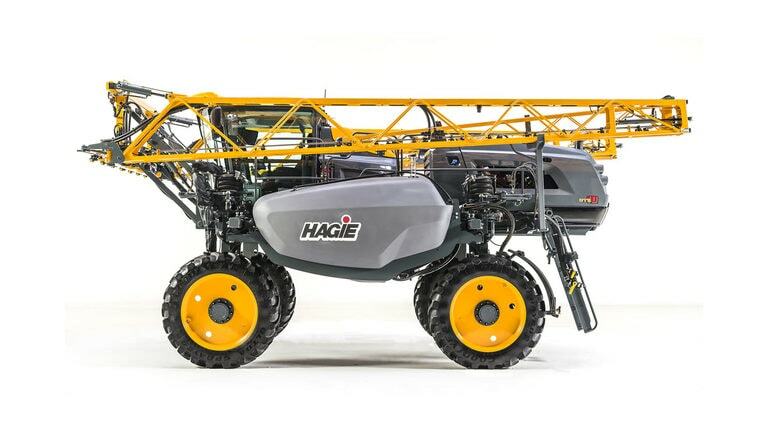 The Hagie DTS10 is powered by a 6.7-L (408.9-cu in.) 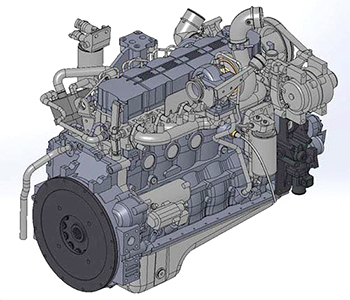 Cummins QSB diesel engine, which is offered in a 158-kW (215-hp) Tier 3 or a 165-kW (225-hp) emissions-compliant Final Tier 4 (FT4) configuration. This 6.7-L (408.9-cu in.) engine is electronic with an air-to-air cooler and turbo charger. The Tier 3 engine requires No. 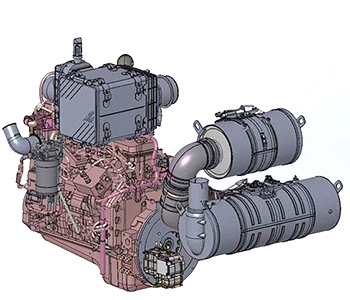 2 diesel fuel, and the FT4 engine requires ultra-low sulfur diesel (ULSD) for export only machines. The rear-mounted engine keeps constant weight to offset the spray boom and leaves space in the center of machine for the varying weight of fuel and rinse tanks. 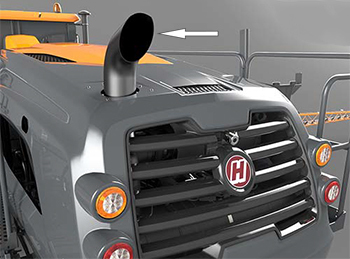 This allows for better coolant airflow and reduction of cab noise. The engine exhaust is located at the rear of the machine. This helps to reduce interior cab and noise vibration. Cummins is a trademark of Cummins Incorporated. 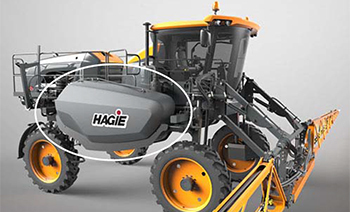 Hagie is a trademark of Hagie Manufacturing Company, LLC and similar to John Deere branded equipment, Deere will also support Hagie equipment. 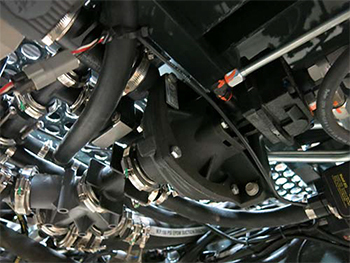 The e-stop switch provides a quick method for stopping the engine in an emergency situation. 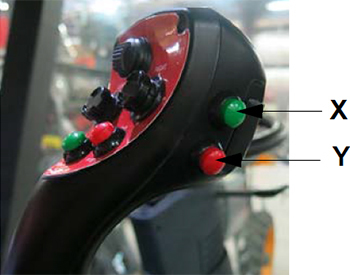 B Foam marker switch (if equipped) The foam marker switch controls foam application on both sides of the machine. C Rinse switch The rinse switch is used to rinse the solution tank and spray booms. 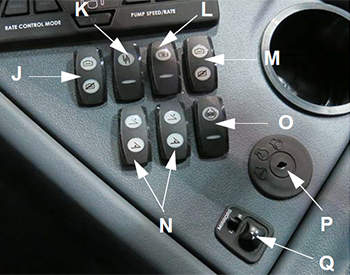 The boom solution valve switches each control a valve located on the boom or transom. The valves control the flow of the solution through the boom. The fence row switches are used in the selection of either the right or left fence row spray nozzle. 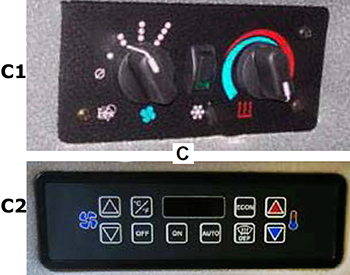 F Rate control switches The rate control switches control the rate in which solution is applied through the spray booms by either the rate controller (enable) or operator-controlled spray rate (manual). 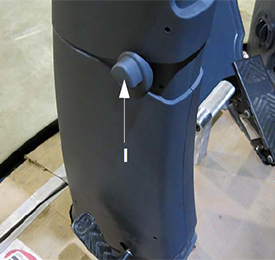 The rear nozzle switch controls the two rear nozzles (located behind the rear tires). The pump speed/rate switches allow the operator to increase or decrease flow rate through the spray system. The main tank valve switch controls the solution tank valve. This switch must be in the on (open) position for spray application. K Solution pump switch The solution pump switch is used to turn the solution pump on or off. L Agitation valve switch The agitation valve switch controls the rate of flow through the agitation system. N Boom extension switches (left/right outer fold) The boom extension switches are used to extend or retract the outer boom extensions. 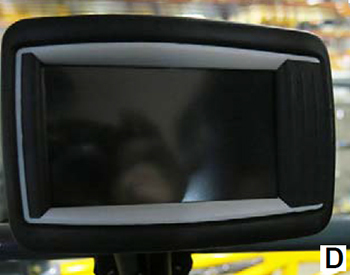 Q Power mirror switch (if equipped) The power mirror switch allows vertical or horizontal adjustment of the electric side-view mirrors by pressing the switch in the desired position. R Hydrostatic drive control handle The hydrostatic drive control handle controls the direction of the machine and the speed in which it travels. It is also used to control the spray booms, master spray, end row management, and shift up/down speeds. 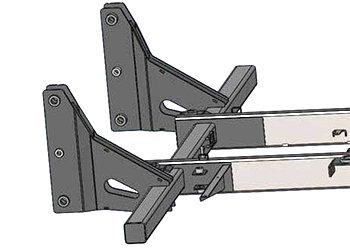 S Transom switch (up/down) The transom switch is used to raise and lower the main lift. T Right-hand boom switch The left- and right-hand boom switches are used to raise, lower, extend, and retract the spray booms. U Left-hand boom switch The left- and right-hand boom switches are used to raise, lower, extend, and retract the spray booms. V Master spray switch The master spray switch activates the boom solution valves. W End row management switch The end-row management switch is a programmable switch that enables various functions (i.e. 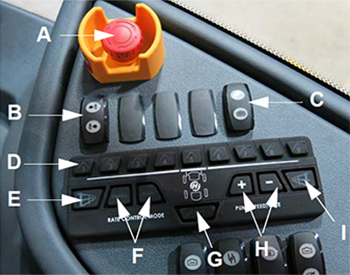 all-wheel steer, auto steer, master spray, and NORAC® enable) when the switch is depressed. End-row management settings are programmed through the machine display. 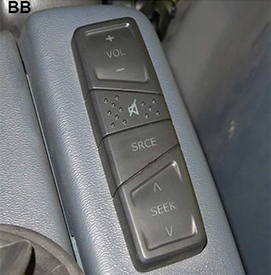 X Shift up switch The shift up/down switches are used for speed range selection. 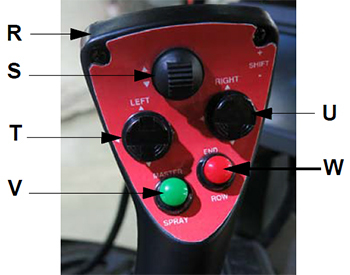 Y Shift down switch The shift up/down switches are used for speed range selection. 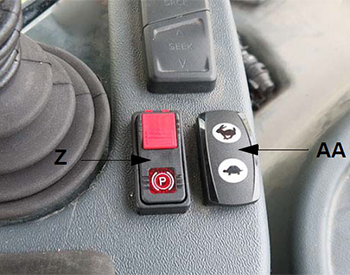 Z Parking brake switch The parking brake switch is used to engage and disengage the parking brake, as well as extend and retract the ladder. AA Throttle switch The throttle switch is used to control engine speed (rpm). BB Remote stereo controls The remote stereo controls are conveniently located to control the stereo (volume, mute, source, and seek). CC 12-V power ports Four power ports are provided for the connection of additional items (such as radios and computer equipment). DD Two auxiliary audio input connections The auxiliary audio input allows connection of a personal iPod® device or MP3 player. The courtesy light comes on automatically when the cab door is opened. 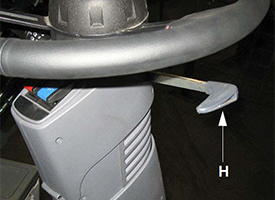 The interior work light is activated by manually pressing the interior work light switch (located on the light housing). 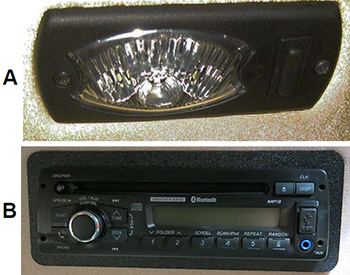 The stereo features with an AM/FM tuner, weatherband broadcasting, CD player, MP3 player, USB/iPod controls, and Bluetooth® wireless system (if equipped). 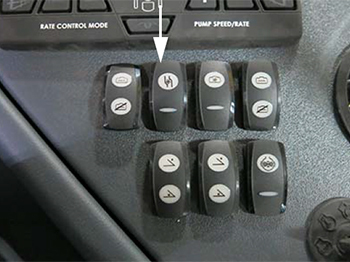 The climate controls allow the operator to set and maintain desired cab temperature. Vents are placed throughout the cab to keep air circulating and to maintain clear windows throughout the cab. The NORAC monitor controls the automatic boom leveling system. The spray system is controlled by the spray system console and the solution pump control valve. 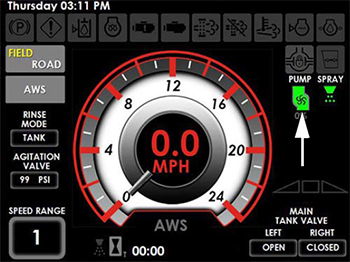 The system receives data and automatically makes adjustments based on the target rate of application set by the operator. 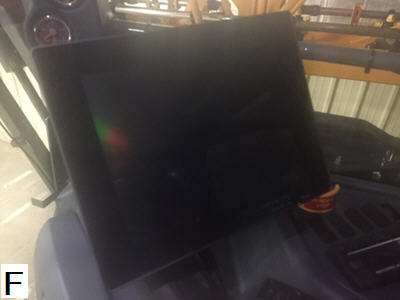 The machine display is the central control center of the machine. 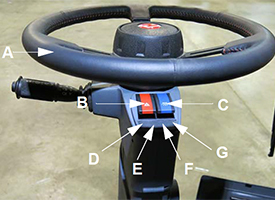 It controls many of the machine’s electronically driven functions (i.e. machine drive, AWS, attachment operation, tread adjustment, spray systems, lights, diagnostics, etc.). 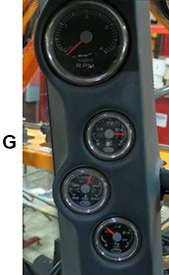 The machine gauge panel on the A-post is conveniently located for viewing engine rpm, fuel level, engine coolant temperature, and engine aftertreatment level (if equipped). NORAC is a trademark of NORAC Systems International, Inc. iPod is a trademark of Apple, Inc. Bluetooth is a trademark of Bluetooth SIG Incorporated. Two 1892-L (500-gal.) polyethylene tanks are mounted on tank cradles on each side of the machine. 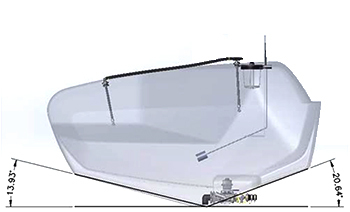 The solution tank design allows the sump to drain on a 30 percent grade and is equipped with a spinball rinse system. A mechanical sight gauge is located on top of each solution tank to visually check the solution level at all times. The Hypro® 9306C-HM1C solution pump (located beneath the center of the machine) is a centrifugal-type hydraulically driven pump that is controlled by the solution pump control valve and the spray system console. It comes with silicon-carbide seals. The solution pump draws solution out of the tank at the rate determined during calibration. It dispenses solution through the many valves and hoses that make up the spray system and also dispenses fluids through the agitation and rinse systems. Hypro is a trademark of Hypro Corporation. 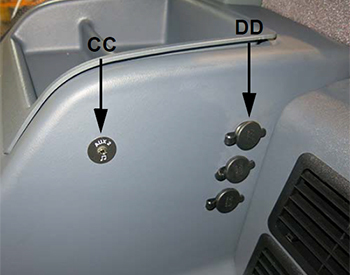 The solution pump switch is located on the side console and is used to turn the solution pump on and off. NOTE: When the solution pump is on, a solution pump indicator (located on the machine display home page - field mode) will illuminate. 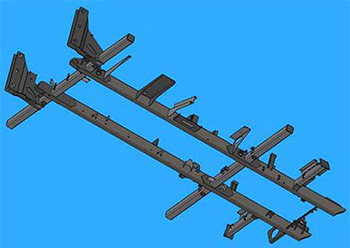 The DTS10 Sprayer mainframe design features horizontal cross-through axle tubes, as well as boom and platform mounts on weldment.